There are many reasons why choosing a log home can provide advantages over more common construction. Building from solid wood is convenient, healthy and efficient. Trees are renewable resources, thus the log homes do not destroy the natural environment. Because we use dead standing trees that dried naturally and not kiln-dried logs, the consumption of natural resources (or embodied energy) of our log homes has much less of an impact than that resulting from sawn lumber. Natural log construction is much healthier than traditional frame homes because it does not contain the toxic materials such as formaldehyde resins that off-gas from oriented strand board (OSB) and plywood. Log homes have been known to last for hundreds of years, their natural strength and resilience enables them to weather the worst conditions and resist the advances of fire. They are very difficult to wear out or and are constantly in fashion. Log homes last. Logs are solid insulation, which means that water vapor has very little effect on its R-value. Space-filling insulation, like fiberglass and cellulose, is mostly air, and requires a plastic film barrier to keep water vapor out of it. When the humidity in fiberglass gets high, it's R-value plummets fast and far. Logs, because they are solid, do not need a vapor retarder. 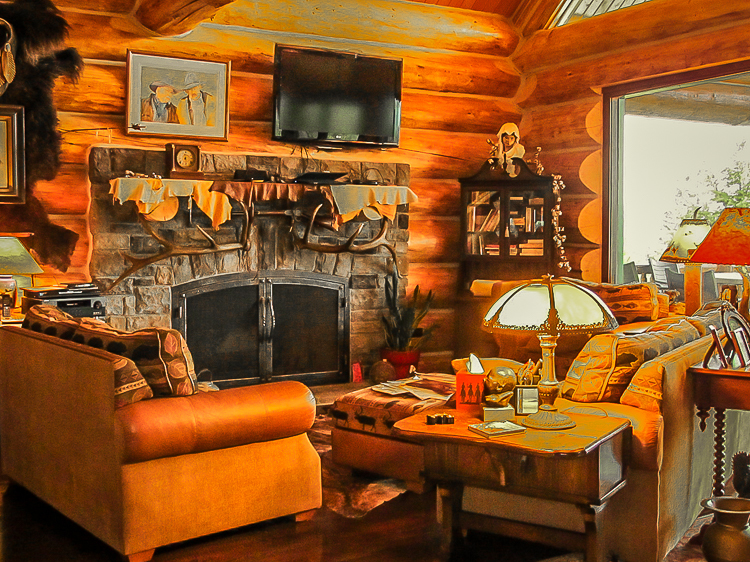 To improve the natural energy-saving quality of your log home, we use insulation between each full-scribe log. In addition to this, we spray our own foam insulation in the roof – which not only has excellent R-value, but unlike fiberglass insulation, it completely seals all air drafts and leaks. As a result, our log homes are energy efficient and comfortable. The wooden walls of a log home are warm to the touch, as opposed to the always chilly sheetrock. Thermal mass, a natural property in the logs, helps to maintain comfortable indoor temperatures in all seasons by collecting and storing energy, then radiating it back into the home. This enables you to have a log home that provides warmth in the winter months, is cool in the summer, and has no issues relating to humidity or interior air-quality. As an added bonus, the wood walls absorb sound thus ensuring your home will provide you with peace and quiet. Log homes even offer benefits in maintenance. You do not need to worry about mold, mildew or insect infestation, since you'll be able to see anything suspicious just by taking a stroll around your home and visually inspecting the logs. Quick detection leads to a less costly remedy. In contrast to a conventional home where sealed wall cavities can be a hidden refuge for issues that will cause far more damage before detection is possible.